All week long, we’re celebrating here on the blog — birthdays, babies, house projects, summer and more! Click here to view the 8 fabulous giveaways — and join in on all the celebration fun! As many of you know from reading my blog, Dave is one of the most calm, easy-going people EVER. He rarely gets upset about anything, he rarely raises his voice, and I’ve almost never heard him swear. If you’ve never heard of pediped — or if you’ve never tried their shoes, let me just briefly share why our family loves them SO much. They are SOOOOOOO easy to get on and off — even for pudgy toddler feet! They are super high quality and we’ve never yet had a pair get worn out before the kids grow out of them. They are comfortable for the kids. Nora ALWAYS complains about how her shoes feel — but never her pedipeds. They come with an insert so you can buy a size up and use the insert until the kids feet are larger… so you can get more wear out of the same pair of shoes. 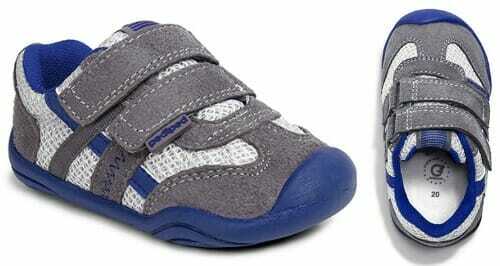 They are designed to ensure healthy foot development for kids of all ages. If that’s not enough to sell you, then I should tell you that all the pediped shoes are REALLY cute — or maybe it’s just my kids! 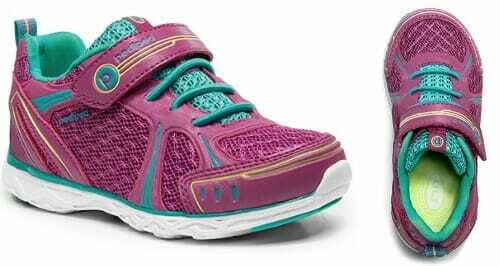 We obviously went with the Flex shoes for Nora — these beauties in Berry and Teal. She loves the color and the “feel” of the shoes. I love that she can quickly and easily get them on and offer herself! The day after we got the shoes, Nora just HAD to go over to my parent’s house so she could use her new shoes to “run really fast down the hill at Grandma and Grandpa’s house”. And yes, I did drive her there just so she could test out her new shoes — boy is she fast! Whether your child is crawling, learning to walk, or running all around, pediped has a stylish shoe that fits comfortably and ensures healthy foot development. It all started with a mom’s hunt to find the best shoe for her little girl. Five years later, pediped is one of the most loved children’s shoe brands around the world. 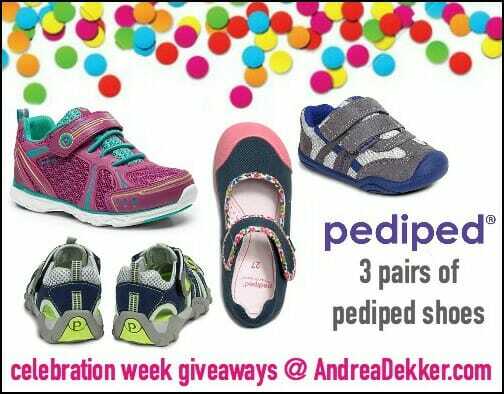 Today, THREE lucky readers will win a pair of pediped children’s shoes. All Celebration Week Giveaways end at 11:59 pm EST, Sunday, 6/21/2015 and are open to US residents, 18 years or older. The winners will be randomly selected via Rafflecopter and notified via email. I received a duplicate prize package in exchange for hosting this giveaway — but all opinions are 100% my own. Please see my full disclosure policy and contact me with any questions you have. Good luck!